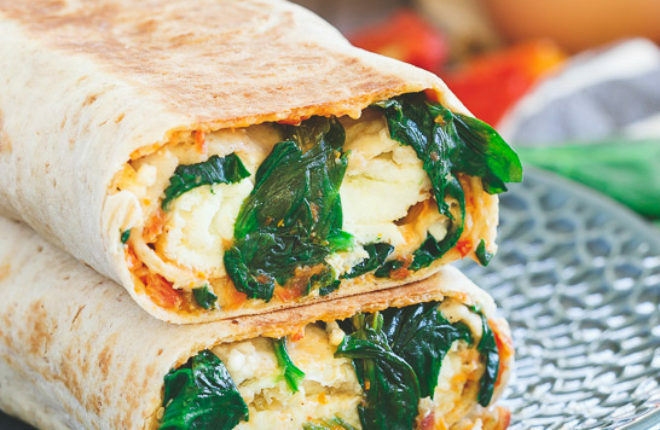 The famous Starbucks breakfast wrap can easily be made at home. 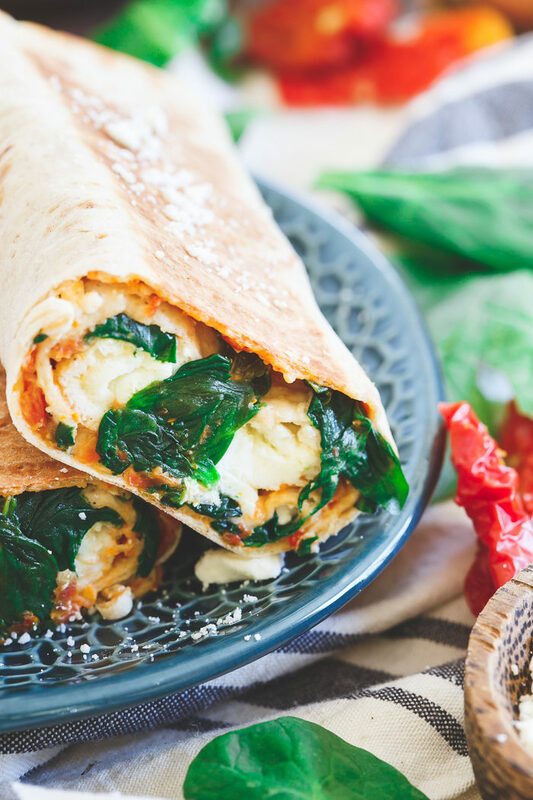 With egg whites, a whole grain lavash wrap, a simple homemade sun-dried tomato spread, spinach, and feta, it’s actually way easier than you might think. Save your money on breakfast and indulge in a fancy coffee concoction instead! Note from Kare: I’d like to extend a warm welcome to Gina from Running to the Kitchen! Gina will be developing and sharing tasty recipes occasionally here on Kitchen Treaty, and I’m thrilled to have her on board. 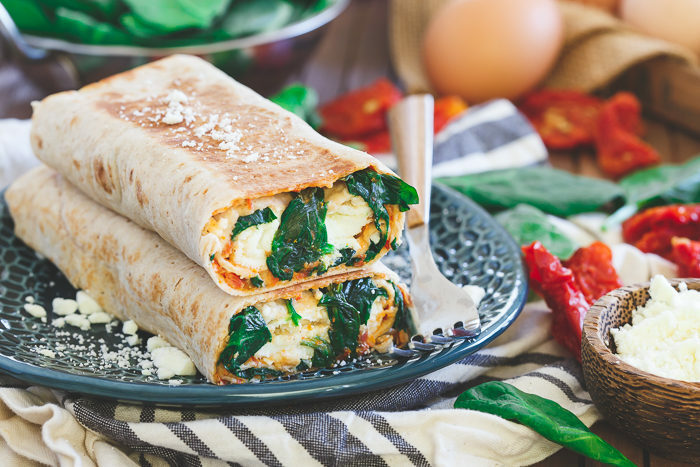 Her first recipe here, this copycat Starbucks Spinach & Feta Breakfast Wrap, is a keeper. I ate two last week (with vegan cream cheese – still excellent) and I basically can’t stop thinking about them. Now I don’t need to throw my money at the Starbucks drive-thru window anymore! Now if only someone could show up at my door with a grande soy chai. Every third Tuesday of the month I have an allergy shot appointment. Nothing like being stabbed in the arm three times before you’ve had your coffee and breakfast all so you can happily coexist with your beloved dog and not be that crazy girl with a tissue shoved up her nose at your friend’s house who has three cats. Horses might make me go into anaphylactic shock, but luckily they seem to be pretty easily avoided. There’s one bright side to this Tuesday morning ritual though, the Starbucks around the corner from the doctor’s office. As someone who will happily stay put in pajamas working on the couch until 10:30 a.m. (ok, let’s be real, 11ish), that Starbucks is pretty much the only thing that keeps me from calling and cancelling the appointment from my blanketed position in the corner of the sectional in the family room. The promise of a venti blonde roast (I’m so boring) with coconut milk or a pump of one of their delicious syrups if I’m being crazy and a warm spinach and feta breakfast wrap are the only things that get me moving. I pull up to the drive through line, place my order and then sit there waiting as the minutes tick forward and the excitement and anticipation slowly turn into irritation. Starbucks is no McDonalds when it comes to drive through efficiency and as a true New Yorker with the patience span of about 1.25 minutes for things like this, by the time I get to the window, I’m pretty sure there is steam coming out of my ears. It takes all my might to remain friendly and polite instead of making some snide remark asking them if they were harvesting those coffee beans in the parking lot or something for my cup. Ten to fifteen minutes later, I’m pulling out of the parking lot, coffee and wrap in hand but at least $10 poorer and not only swollen bumps on both my arms but a frustration level through the roof. Here’s the good news, I decided to look into these wraps and realized when you break them down, there’s pretty much nothing so special about them that you can’t make them at home! The even better news is that by doing so and eating it on my way to the allergist instead of afterwards, I’m not a cranky you-know-what when ordering my coffee. It also makes the prospect of someone inserting sharp metal pointy things in my arm three times a little more bearable. I personally love lavash wraps for these (they’re so much easier to roll, you get much more surface area and calorically speaking, they’re a way better bang for your buck!) but you can use tortillas too. The cream cheese is simple and can actually be made in bigger batches ahead of time and stored in the refrigerator for a week or two. With that made already, it’s literally just cooking up some egg whites, spinach, and a sprinkling of feta. It couldn’t be easier or quicker to make at home and now you have a few extra bucks to jazz up that coffee order instead. 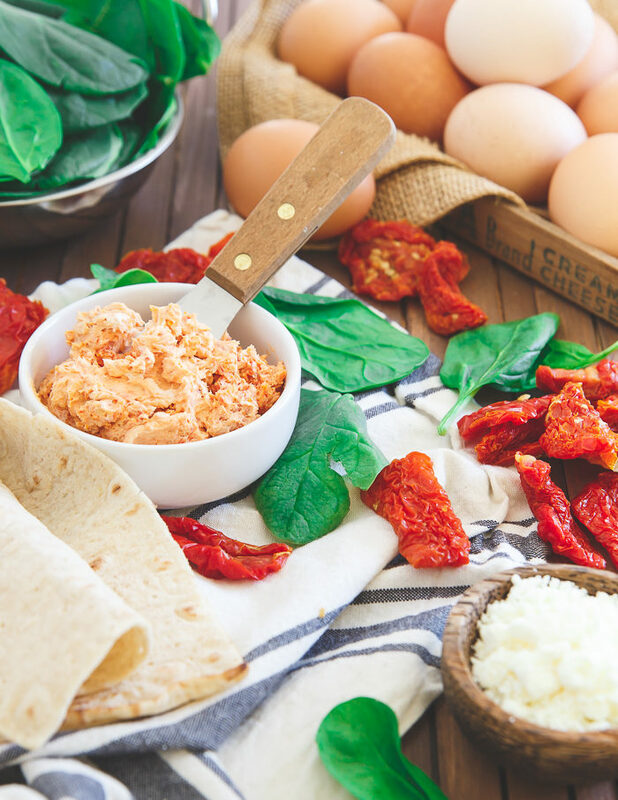 Make the sun-dried tomato cream cheese spread. Combine the cream cheese, sun dried tomatoes, and olive oil in a food processor. Pulse a few times until blended together with small chunks of tomatoes remaining. Season with 1/8 teaspoon salt and the pinch pepper, adding more to taste if desired. Set aside. Place the olive oil in a large skillet over medium heat. When hot, add the spinach and cook, stirring occasionally, until wilted, 1-2 minutes. Transfer to a small plate and set aside. Add the egg whites to the same skillet. Add the pinches of salt and pepper and cook, first stirring with a whisk and then flattening with a spatula as they set, about 2 minutes total. Using the spatula, fold the cooked egg whites into thirds, then turn off the heat and set aside. Assemble the wrap. Spread an even layer of the cream cheese on the lavash wrap or tortilla. Sprinkle the spinach evenly across the cream cheese layer and top with the feta. 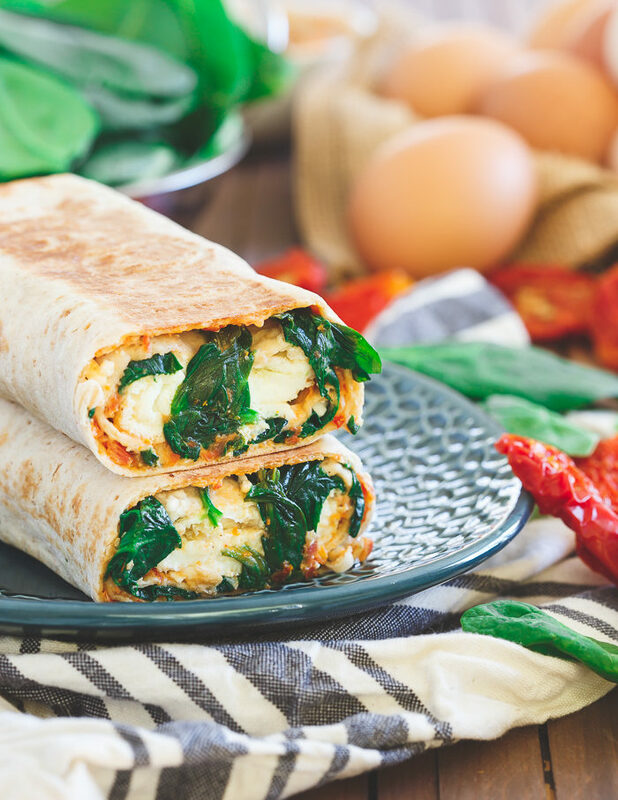 Place the egg whites at the edge of one side of the wrap. Roll the wrap up and place back in the skillet over medium-low heat with the seam side down. Cook until just golden brown on each side to toast the wrap, 1-2 minutes on each side. Slice in half and serve. These look great! Where can I find lavash wraps? Can anyone recommend a brand, in case I have to order them online? Hi Peggy, I have found them at Whole Foods, though I can’t remember the brand name. I believe Trader Joe’s also carries them. Hope that helps! Walmart sells Josephs Flax Lavash Bread, Oat Bran & Whole Wheat Lavash Bread. My Walmart has them in front of the deli counter with the Flat Out. I’m sorry, but not surprised. The nearest Whole Foods or Trader Joe’s is two hours (one way) from my home. Guess I’ll be looking for recipes or using tortillas. If the lavash comes out cracker-like, my husband likes that, so it won’t be a wasted effort. Thanks for the info; I will definitely look for these the next time we roll through a town that has either of those larger stores. I’ve seen lavash wraps at Kroger. But not all Kroger carry them. 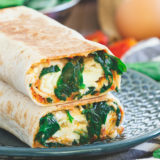 Is this wrap 970 KCal? I am praying this is a misprint. This will be close to 1/2 my daily tptal. I think you’ll need to omit the egg whites for a vegan version! I want to try that too! Let me know how it goes if you do. Oh my gosh I tried this wrap at starbucks last week. It was actually delicious and tasted very healthy 😉 I will definitely have to try this at home. Hi 🙂 Have you tried making these in bigger batches & freezing? Just wondering if it would work — thanks for sharing! Yes, they freeze really well!